école : références: SYNTHETIC PHONICS IS THE BEST ! 9.1 At the beginning of Primary 1, one group of children learnt to read using the synthetic phonics programme. 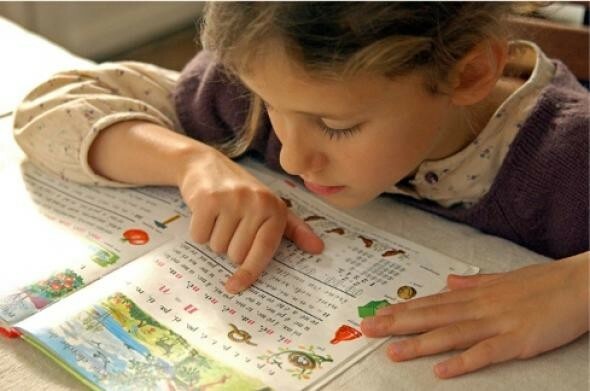 They were compared with two groups learning to read by analytic phonics programmes; one of these programmes was a standard analytic phonics programme, but the other one contained intensive training to enable children to hear sounds such as phonemes and rhymes in spoken words. At the end of the 16 week training period, the synthetic phonics group were reading words around 7 months ahead of chronological age, and were 7 months ahead of the other two groups. The synthetic phonics group's spelling was also 7 months ahead of chronological age, and was around 8 to 9 months ahead of the two analytic phonics groups. These groups were spelling 2 to 3 months behind chronological age. The synthetic phonics group also showed a significant advantage in ability to identifying phonemes in spoken words, performing even better than the group that had experienced direct training in this skill, despite the fact that these children were from significantly less advantaged homes than the other children. The phonemic awareness programme was found to have no benefits for literacy acquisition. 9.2 The two analytic phonics taught groups then carried out the synthetic phonics programme, completing it by the end of Primary 1. In the meantime the initial synthetic phonics group consolidated their learning rather than moving on to learn new grapheme to phoneme correspondences. During the course of Primary 2 some children in the original analytic phonics taught groups received extra help, but this was not necessary for the initial synthetic phonics taught group. At the end of Primary 2, the initial synthetic phonics taught children were significantly better spellers, and there was a trend towards better word reading skills. When separate analyses of word reading were carried for boys and girls, it was found that early or late synthetic phonics teaching had no impact on the boys reading attainment. However, the analysis for the girls showed that the early synthetic phonics trained group read words significantly better than the group that had received the standard analytic phonics programme first. We conclude that in order to foster good spelling skills, and to assist girls in learning to read, synthetic phonics should start early in Primary 1. 9.3 We have conducted an analysis of the children's performance from Primary 2 to Primary 7, comparing the same children right through in word reading, spelling and reading comprehension. This was to gain an exact measure of whether the gains the children experienced from the Primary 1 programme were maintained, or whether they increased or decreased. It was found for word reading and spelling that the gain in skill compared with chronological age had increased significantly over the years, even though the training programme had ended in Primary 1. In Primary 2, word reading was found to be 11.5 months ahead of chronological age, but in Primary 7 it was 3 years 6 months ahead. For spelling, in Primary 2 it was 1 year ahead, whereas by Primary 7 it was 1 year 9 months ahead. However, for reading comprehension, a different pattern was shown. In Primary 2 the children were comprehending what they read 7 months ahead of chronological age, but by Primary 7 this had dropped to a 3.5 months advantage. Adams, M.J. (1990) Beginning to Read: Thinking and Learning about Print. Cambridge, Mass: MIT Press. Blenkin, G.M and Kelly, A.V (1987) Early Childhood Education. A Developmental Curriculum. Paul Chapman Publishing:London. Clay, M.M. (1979). The early detection of reading difficulties. Heinemann: London. Cunningham, A.E. (1990) Explicit versus implicit instruction in phoneme awareness. Journal of Experimental Child Psychology, 50, 429-444. Dale, E., and Riechert, D (1957) Bibliography of Vocabulary Studies. Columbus, Ohio:Ohio State University, Bureau of Educational Research. Davie, R., Butler, N., and Goldstein, H (1972) From Birth to Seven: A Report of the National Child Development Study. London:Longman. Duncan, L.G. & Seymour, P.H.K. (2000) Socio-economic differences in foundation level literacy. British Journal of Psychology, 91, 145-166. Dunn, L.M. and Dunn, L.M (1982). British Picture Vocabulary Scales, Windsor: NFER-Nelson. Elliott, C.D., Murray, D.J., and Pearson, L.S. (1977). The British Ability Scales, Windsor: NFER Nelson. Fawcett and Nicolson (1996) The Dyslexia Screening Test. The Psychological Corporation. Harcourt Bruce & Company, London. Feitelson, D (1988) Facts and Fads in Beginning Reading. A Cross-Language Perspective. Ablex: Norwood, NJ. France, N. (1981). Primary Reading Test. Windsor: NFER-Nelson. Harris, L.A. and Smith, C.B. (1976) Reading Instruction: Diagnostic Teaching in the Classroom (2nd Edition). Holt, Rinehart and Winston: London. Johnston, R.S. and Watson, J.E. (2004) Accelerating the development of reading, spelling and phonemic awareness skills in initial readers. Reading and Writing, 17, 327-357. Juel, C (1988) Learning to read and write - a longitudinal-study of 54 children from 1st through 4th grades. Journal of Educational Psychology, 80, 437-447. Macmillan Unit (2000) The Group Reading Test II. NFER Nelson: Windsor. Morris, J (1984) Phonics: from an unsophisticated past to a linguistics-informed future. In Brooks, G and Pugh, A.K. (Eds) Studies in the History of Reading. Centre for the Teaching of Reading: Reading. Mullis, I.V.S., Martin, M.O., Gonzalez, E.J., & Kennedy, A.M. (2003) PIRLS 2001 International Report: IEA's Study of Reading Literacy Achievement in Primary Schools, Chestnut Hill, MA: Boston College. Muter, V, Snowing, M and Taylor, S (1994) Orthographic analogies and phonological awareness: their role and significance in early reading development. Journal of Child Psychology and Child Psychiatry, 35, 293-310. Nicolson, R and Fawcett, A (1998) Dyslexia Early Screening Test. Psychological Corporation Ltd., Harcourt Brace & Company. Schonell, F.J and Schonell, F.E. (1952). Diagnostic and attainment testing. second edition. Edinburgh: Oliver & Boyd.Stanovich, K. 1986. Matthew effects in reading. Some consequences of individual differences in the acquisition of literacy. Reading Research Quarterly, 21, 360-406. Stuart, M, Dixon M, Masterson J, and Quinlan, P. (1998) Learning to read at home and at school. British Journal Educational Psychology, 68, 3-14. Watson, J (1998). An investigation of the effects of phonics teaching on children's progress in reading and spelling. PhD thesis, University of St Andrews. Wilkinson, G. 1993 Wide Range Achievement Test -3 rd Edition (WRAT-3). Wide Range: Wilmington, Delaware. Yopp, H.K. (1988). The validity and reliability of phonemic awareness tests. Reading Research Quarterly, 23, 159-177). The views expressed in the report are those of the author(s) and do not necessarily reflect those of the Scottish Executive or any other organisation(s) by which the author(s) is/are employed.The Scottish Executive is making this research report available on-line in order to provide access to its contents for those interested in the subject. The Executive commissioned the research but has not exercised editorial control over the report.The Executive has not published this full report in hard copy, but a summary version has been published in the Insight series (ISSN 1478-6788 online) as Insight 17.Insight 17 is also available online at www.scotland.gov.uk/library5/education/ins17-00.asp with a limited print run available from the Dissemination Officer, Information, Analysis & Communication Division, Scottish Executive Education Department, Victoria Quay, Edinburgh, EH6 6QQ (telephone 0131-244-0316).Both reports were published on The Scottish Executive website on 11 February 2005.